Do you want to solve your hair lost / pimples scars / wrinkles / Stretch mark problem? You can solves them all by using derma roller!! 1 Ice-pick Ice-pick scars are 1-2 mm in diameter. They are so named as they form very narrow incisions into the upper level of the skin; similar to a small ice-pick wound. This type of scarring is characterized by deep pits that are usually less than 2 mm across. They extend into the skin, giving the surface appearance of having been punctured by an ice pick. They are narrow and deep, extending well into the dermis. There are other ice pick scars however that are larger, and don't extend that deep into the skin. Ice pick scars develop from a deep infection in the skin, mostly the dermis. Upon development, the infection makes its way to the skin surface, creating a cyst. The cyst persists and forms the ice pick scar. 2 Pitted / Boxcar Boxcar scars measure more than 3 mm in diameter and appear similar to chicken pox scars. They cause round depressions on the dermis and give the skin a matted appearance. They are angular scars with sharp vertical edges. Boxcar scars may be shallow or deep. Boxcar scars appear like valleys on the skin. These pit scars are created when there is tissue loss in the skin because of an acne breakout. The skin is left without support and therefore collapses under its own weight. A depression is left in place and this is what causes the pits. The depth of the depression may differ depending on the severity of the acne infection. Usually, the more severe the acne, the more the skin loss and the bigger the boxcar scars. How Boxcars Develop? When an inflammatory breakout destroys collagen, tissue is lost. The skin over this area is left without support, and a depressed area is created. Boxcar scars may be superficial to severe, depending on the amount of tissue lost. 3 Rolling Rolling scars cause abnormal wave-like undulations on the dermis. They are usually 4-5 mm in diameter. They are caused by damage under the surface of the skin, and give the skin a wave-like appearance. They tend to be wide and shallow. These give the skin a bumpy appearance. The name rolling is used because of how the scars appear. The best term for description is wave like. Fibrous tissue develops in the subcutaneous region of the skin. They then bind to the epidermis, leading to the creation of the undulations. 4 Hypertrophic / Keloid Hypertrophic or Keloid scars tend to appear when the Acne clears out. They are raised lesions which tend to get larger with time. They might itch or be painful in certain cases. 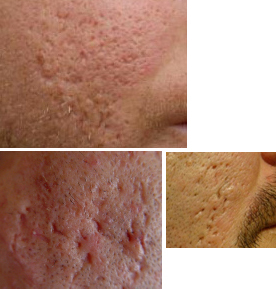 They are often the result of more severe acne lesions, such as cysts or nodules. Hypertrophic scars generally stay within the boundary of the original wound, and may decrease in size as time goes on. 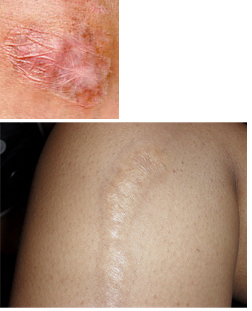 Keloid Scars (a type of hypertrophic scarring), on the other hand, may scar beyond the original wound site. These kinds of scars are raised over the skin tissue. They are more apparent in the torsos of men. What happens is that there is an elevation in the production of collagen. They are different from ice pick scars in that there is no loss of skin. By appearance, this kinds of scars look like an accumulated mass of tissue. 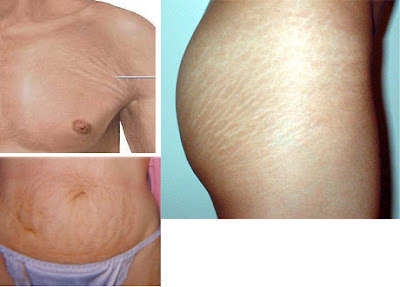 5 Stretch Marks Stretch Marks happen when the skin is pulled. Normally it happen after a woman get pregnant, after a man build bigger muscles, after a person get fat. 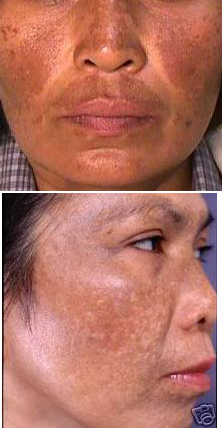 6 Pigmentation Pigmentation or Hyperpigmentation is Post-Inflammatory Hyperpigmentation or PIH. When your skin becomes irritated, your melanocytes become stimulated to produce melanin and the color can range from purple, red, brown or black. Once your pimple starts, melanin already begins to produce, but picking at it stimulates the melanocytes more causing even more hyperpigmentation which then makes it harder to fade (More pigment=longer fading time). Unlike real scarring, PIH still feels like skin (isn’t tougher texture). It just has the coloring. 7 Burn Scar Burn scars appear after u are burn by heat or fire. A dermaroller can remove all those scars that listed above. Most of scars treatments are using the same concept > If you skin has permanent scars, you need to damage or destroy your skin by using laser or chemical peel or dermamembran or derma roller. Then regrow the new layer of prettier and healthier skin. The same happen if you use derma roller, there are many needles on the roller, you roll your face by using derma roller, all the needles poke into your face to damage your skin. Furthermore, the needle will poke into your skin to stimulate the collagen under your skin, the collagen responsible to regrow and repair your skin effectively and beautifully. Please eat more vitamin E or drink more collagen or apply collagen masks on your face to regrow the new perfect beautiful skin. Water is the key for healing the injury, so please make sure your face is moisturized after rolling. You can apply moisturizer cream or hydrating facial masks to give water to your face after rolling. From the video above, you should know laser treatment acts like derma-rolling treatment, they both create many holes on skin, damage the skin. Then use collagen to get a better smoother skin. Normal laser treatment price is rm500 per session, rm3000 for 6 sessions. Normal laser can't fix the deep scars. You need Advance Laser Resurface Tech which will be more expensive. Derma roller treatment is rm100 for 30 sessions. Actually you can use the roller for more than 30 times if the head of needles are still sharp. You can use derma roller anytime and anywhere and you can do it by yourself.